Never was the volume of international goods transport higher than during this decade. Today, the meaning of the "made in" label is more important than ever. For this reason, Statista has developed the Made-In-Country Index. 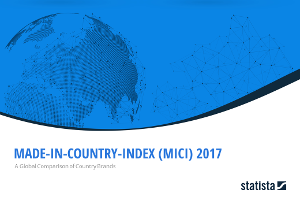 This global survey allows for a reliable definition of standard value for brand strength in different countries and a transparent evaluation of the value of labels. In cooperation with Dalia Research, we surveyed 43,034 consumers worldwide. The countries included in this sample represent 90 percent of the global population.